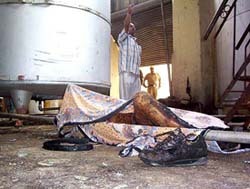 Excise inspector of the Himachal Government Shakti Chand Rana was killed and peon Pyar Chand was injured seriously when an explosion took place in a fermentation chamber at a liquor factory they were checking. The District Consumer Disputes Redressal Forum, Sangrur, has directed Dr Sumeet Sofat and Dr (Ms) Sumita Sofat of the Sofat Infertility and Women Care Centre, Ludhiana, to refund Rs 2.25 lakh charged by them from a couple for undergoing treatment for infertility along with nine per cent interest from August 20, 2003, till the date of the payment. The much-hyped mega projects cleared by the Punjab Government came under a veiled attack today from Mr Shamsher Singh Dullo, president of the Punjab Pradesh Congress Committee. 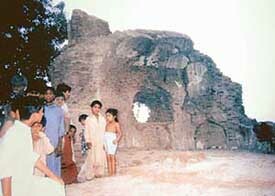 The samadhs of Maharaja Sher Singh, his wife Maharani Randhawi, Dharam Kaur and Rani Partab Kaur, located in Lahore have been vandalised by local people there, oblivious of its great heritage value. Rattled by the agitations launched by various farmers' organisations, including the various factions of the Bharti Kisan Union( BKU), the Chief Minister, Capt Amarinder Singh, has decided to meet the Prime Minister, Dr Manmohan Singh, to redress grievances of farmers. Farmer bodies today boycotted grain markets by setting up nakas to register their protest against the import of wheat and the silence of the Union Government on their demand to increase the minimum support price of wheat. The international airport proposed to be built at Ludhiana announced by the state government was in violation of the guidelines of the Airports Authority of India. There will be no increase in the power tariff rates in Punjab. This is clear from the stance taken by the state government at a meeting held with the Punjab State Electricity Regulatory Commission. The Punjab Government today announced its programme to commission 43 new grid substations till January, 2007 in a phased manner to facilitate better quality of power supply. About 1,000 children (10 to 15 years) from all over India and also from South Asian countries were expected to participate in the six-day Sixth National Children’s Festival from April 18 at Government Senior Secondary School, Chheharta. A meeting held here today under the presidentship of Mr Om Parkash, circle president, Ministerial Staff Services Union of the PSEB, strongly condemned the board’s management for withholding the annual increments of lower division clerks for not fulfilling the clause of type test. A multi-speciality camp was organised at Brain Hospital here today. A team of doctors from Satguru Pratap Singh Apollo Hospital , Ludhiana, comprising Dr K.C.Mukerjee (heart surgeon ), Dr Chetan Sharma (cardiologist), Dr S.K.Somani (gastroenterologist), Dr Harpreet Singh Gill (orthopaedics ), Dr Rahul Kohli (nephrology ), Dr Gurpreet Singh (endocrinology), Dr Dinesh Goyal ( pulmanology), gave consultation to patients free of cost. A delegation of PCMS doctors led by its District President Dr Harish Malhotra and Dr D.S Bhullar, who is also the Chairman, service wing of IMA, met the Health Minister Mr R.C Dogra and the Health Secretary, Mr D.S Guru, during their visit here yesterday. Inderpreet Kaur Dardi has topped the list of successful doctors in the district. They had been contracted by the Punjab Government for three years through zila parishads to be employed in rural dispensaries across the state. The 251st birth anniversary celebrations of the founder of homoeopathy, Dr Samuel Hehnemann, were organised at the Rose Garden here by members of the homoeopathic Education and Research Foundation. The Punjab and Haryana High Court today allowed the Punjab Government to make provisional selections for filling posts of primary or elementary trained school teacher, also known as ETT teachers. Small farmers of hilly areas of the state now can have alternative source of income. The Department of Horticulture has introduced Eri-Culture in the district. A minor girl was gangraped and killed brutally here late last night. Four armed robbers entered the house of the Balwinder Kaur, in Kaluwal village and after tying the inmates, decamped with Rs 5,000 and gold ornaments yesterday. The police has arrested four persons in connection with an assault on coloniser Ravi Sethi and former Bar Association chief Satish Narang. Sethi’s driver Jagdish had succumbed to his injuries after the assault early this month. Mr Sethi and Mr Narang were under treatment in New Delhi and Amritsar hospitals. A vehicle thief fleeing with a jeep found himself in soup when he hit a motorcycle near Jeeda village that led to the death of a brother-sister duo today. Three policemen, Kulbir Singh and Surinderpal Singh (both head constables) and Ashok Kumar, a constable, along with a woman were arrested by the Civil Lines police last evening. Expensive computer parts, including processors, CD-ROMs and hard discs, were stolen from the local Patel Public School by an unidentified person here last evening. Students in border areas are being supplied notebooks carrying scenes from films and titles of popular songs on the cover. The School of Business Management organised a workshop on ‘‘BE-MBA —Advantage’’ here today in the main auditorium of the Thapar Institute of Engineering and Technology (TIET).